Monitor your environment in the home or the workplace - both places that can suffer from moisture-draining air conditioners and heating systems, with this digital thermometer and hygrometer. Hygrometers measure humidity and temperature and give you a sense of the relative humidity - meaning the feeling of how hot or cold you "feel" rather than the exact heat or coolness of the air. 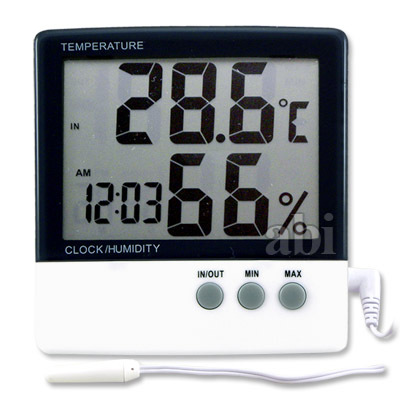 Place on a table or hang on the wall, this unit works indoors and out has a large clear screen and accurately reads both the humidity and the temperature in either Celsius or Fahrenheit. จอภาพขนาดใหญ่ 8 x 6 ซม. ตัวเลขใหญ่ ขนาด ความสูง 3 ซม.